The Match is again tied, this time at 5-5.
and does the same with Veselin Topalov. 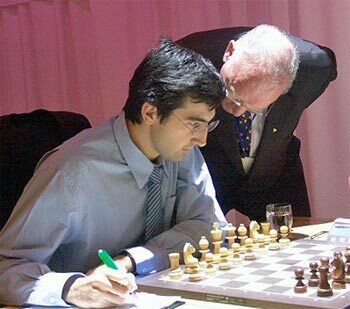 Might Kramnik's forfiet of Game 5 come back to haunt him? Vladimir, you have already been asked several times about yesterday, so I will ask you something different ’Äì how did you spend last night? 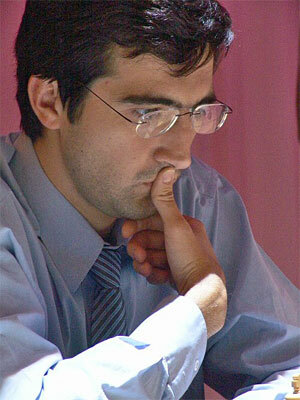 Vladimir Kramnik: The day was not good, but I slept OK last night. I have already said many times that I am a professional. OK, yesterday’Äôs game was not the best I have ever played, but so what ’Äì it is not a reason to fall to pieces. As you see, today I played normally again. There was applause. The last time I heard this was probably at Dortmund, after I beat Leko in the last round, to win the tournament. After my games, they more often boo, but occasionally they applaud (smiles). Chess players get applauded most often in Belgrade ’Äì this, of course, is great. They usually get over a thousand people at each round, and after every game finishes, if it wasn’Äôt a bloodless draw, there is tumultuous applause. It’Äôs like being in a theatre. How did you feel when Veselin played 24’Ä¶f6? I admit that this move was a big surprise for me. At first, I was dazed ’Äì there is both Qg4 and Nd7, and I didn’Äôt know which to choose! Why did Veselin play this? The tension was enormous, and he is not made of wood, he also makes mistakes...Yesterday I gave Veselin a present, today he returned the compliment. As far as the position is concerned, I think that with correct play, Black could hold and the game would most likely be a draw. I was so deeply absorbed in calculating the variations, that the move 24...f6 came as a shock to me. At first, I thought it must be some sort of trap, and therefore I spent some time, trying to work out what Veselin was up to, but in the end, I couldn’Äôt see it, so I just played 25.Nd7. Veselin made further mistakes after that. For example, the move 28’Ä¶Rxd4 is a mistake, he should play the rook to e7, when White still has to demonstrate some technique. After the capture on d4, absolutely everything wins. I tried to play the position as simply as possible, avoiding any risk. In principle, I could at several points have won a piece by f2-f3, but I decided to quietly exchange queens and win the ending. I am not sure what to say. At the end of the day, I won the game anyway. But, firstly, there was not an immediate draw ’Äì the position was still complicated. When going to the game, I just wanted to reach a complicated, fighting position. 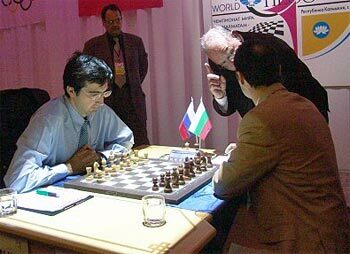 It is extremely difficult to win a game in the very opening, so it seems to me that in such a match situation, the best thing is to aim for a complicated struggle, maintain the tension, and wait for the opponent to make a mistake. That is what happened today. Yes, he tried. But so far, fortunately, there has not been a single game in which I have fallen into really serious time trouble. There was pressure, but that is normal. Bad form is when you have a few minutes for 20 moves, but when you have 5 minutes for 3 moves, as I did today, this is a normal, everyday situation. Veselin always has half an hour or so left by the time control, but that is his problem. For me, it doesn’Äôt make a great deal of difference, whether I have 5 minutes or 30. The main thing is to play normal moves. Today I thought longer, but, it turns out, more effectively. What do you think generally of your opponent’Äôs tactic of trying to play quickly, so as not to give you time to go to your rest room? I don’Äôt know what their idea is. I think they just want to put me in an uncomfortable position. Certainly, during world championship matches, I am in the habit of going to my rest room when it is the opponent’Äôs move. There is a demonstration board there, and I can quietly think about the position; there it is less oppressive, quieter, and nobody disturbs me. My opponent’Äôs ’Äútactics’Äù are designed to force me out of my usual, comfortable routine and break my usual rhythm. But in principle, I can sit quietly at the board as well. I don’Äôt think the game is worth a candle ’Äì firing moves out like bullets, even if they are of only average quality, just to irritate me. Not that I am applying this to Veselin. Vladimir, during the last game, you had not one, but two bottles of liquid on your table. Your position, excuse me for saying so, was so dreadful, that one couldn’Äôt help thinking about the comparison between ’Äúdead’Äù (still) and ’Äúalive’Äù (sparkling) water. Can you say whether the liquids were the same or different? It was ’ÄúArkhis’Äù mineral water!! It was just a reserve. I drink a lot during the game. When I went to my room, I forgot to take the bottle, and couldn’Äôt remember whether there was any left there or not, so I took another back, just in case. Sometimes your opponent moves, you sit thinking about your move, and want a drink, but there isn’Äôt any water. So, I put a second bottle on the table. You’Äôre not worried about protests over your using two glasses? Yes, I played them the day before yesterday. I can’Äôt say that it did me any good in yesterday’Äôs game. I hope that it is not a question of drums, but how one plays the game. Then I still have hope. Veselin, can you explain your move 24’Ä¶f6? A bit later, but that doesn’Äôt really matter. I should have taken on b5 and Black is not too badly off. This was my first idea, but then I decided that 24’Ä¶f6 was also interesting. In the last few games, you have clearly had the initiative in the match. Could it be that the move 24’Ä¶f6 was the result of a certain relaxation, or over-confidence? It seems to me that 24’Ä¶f6, compared with taking on b5, is the more complicated move. If I play 24’Ä¶Bxb5, we get an ending with slight pressure for White. I looked at the clock, and since my opponent had less time, I decided to play the more complicated line.